It’s about time that I posted my Funky Foto Flashback picture of a car! I’m a bit tardy in posting a car picture; after all, Keely already did way back in March, and then last week Peggy had a fun story to go along with her car picture. We knew we were getting close to my grandparents’ house when we started driving along the river. Then we would turn right, and start driving up. Up we would go, passing houses on the right and trees on the left, driving higher and higher. Their house was the last, nestled on the hillside which continued to rise beyond the house my grandfather built. In front of the house was a circle drive, tilted on that hill. I remember walking down to the bottom of the drive through the grass, holding my mother’s hand. The toes of my sneakers soaked in the dew. I was four; my sister was three. 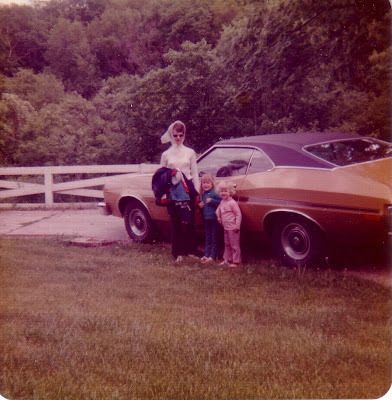 My parents had just bought a 1973 Torino; they liked it so much their next car was a dark brown Gran Torino. I don’t remember the last time I was at the house. My grandparents also lived in a apartment in Des Moines, which is where I visited them for many years. The house was sold after my grandfather’s death; I wish I had been able to see it one last time. It was falling apart, literally, and it may be demolished by now. And I thought this post was going to be all about a car! This blog has a mind of its own.